Earlier today a young couple got married in London and, to celebrate the occasion, we all got the day off work. I arrived at the pub at about 10.30am and stayed until 7pm, but not a drop of alcohol passed my lips until I’d returned home. The Four Bells was running a royal wedding party, and somehow I’d found myself swept up in the preparations – initially as editor of the local news website, and also to help my daughter raise money for the local Guides troop. From early in the planning for the event, months ago, it was clear that there would be quite a lot of media interest. At the first planning meeting I gave an interview to the local BBC radio station, which was the first of many reports the station carried on the preparations for the big day. The local daily newspaper and ITV News also gave it some coverage, but it was the BBC which kept coming back for more, both on radio and TV. Yesterday, I was among those asked to come to the Four Bells a day early so we could be filmed making our final preparations. Today, BBC East Midlands Today was out in force with two news crews and a full outside broadcast unit on station. They spent the entire day with us, and even the regional weather report came from the pub’s beer garden. The story presented was unremittingly one-dimensional: here in rural Nottinghamshire there was a community drawn together in common purpose – to celebrate the royal nuptials, and by extension the continuation of monarchy. The story had to fit into the catalogue of similar tales being broadcast from up and down the country, from the New Forest to Newcastle, that for this day at least Britain loves its royals. I think this uniform and superficial coverage should be challenged. Yes, it was a pleasant day and yes, there are plenty of ardent royalists in the population. But for many people the day was appreciated mainly for being a bonus holiday, and the union of two people from very privileged backgrounds, hundreds of miles away, was of little actual interest. Put the republicans and anti-royalists to one side, and the monarchists and imperialists to the other, and what’s left in the middle is a large mass of people who really couldn’t care less. But this is not the impression anybody might get from today’s coverage. Time after time the cameras focused on the flag waving, hat wearing, happy faces. People who, we are supposed to believe, were only flag waving, hat wearing, and happy, because of a wedding in Westminster. The cameras saw bunting by the hectare, cheering children, and above all they saw crowds. Those things were all there, but it was incredibly localised. Half a street away the village was as quiet as on any other holiday. In the next village, and the next, there was no street party, no bunting, and little to mark the occasion other than a few more people than usual enjoying the spring sunshine, walking, having a pint, tending the garden. The reason the BBC was so keen to broadcast from the Four Bells was that it was the only party for miles around. Elsewhere, interest and support for the royal wedding ranged from calm interest (spurred at least a little by the inescapable media coverage) to mild apathy. 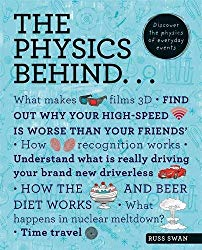 So why does the BBC feel the need to lead public opinion, rather than merely report it? I have to admit, though, that I was very happy about one aspect of the BBC coverage. Our Guides fundraising centred around a game we had made specially for the occasion, using an old stepladder, some cardboard tube from a roll of carpet, and some dog puppets made of brown socks. It was called Splat the Corgi, and offered a mildly subversive means of letting off steam. 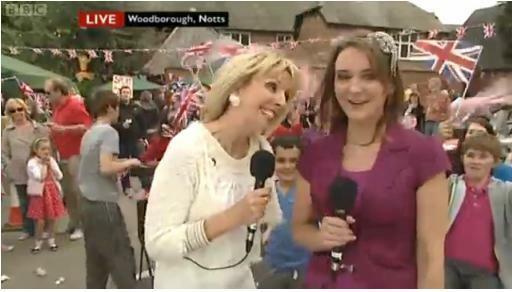 Not only did it prove extremely popular with the party goers, but the anchor of East Midlands Today, Anne Davies, did a live broadcast playing the game and interviewing my daughter on the 6.30 news. It’s a small thing, but it’s a thing all the same. A tiny squeak of not-quite-pro-monarchist fun to be seen floating on a sea of loyalist royalist subservience. And it was my part in the fall of the House of Windsor. 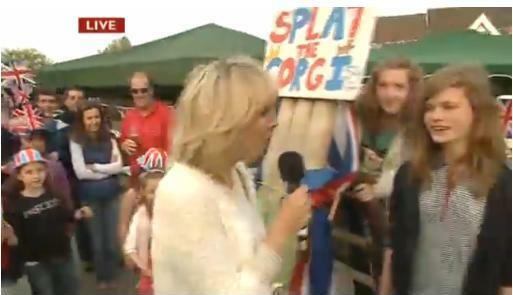 Splat the Corgi live on the 6.30 news, but does the BBC lead opinion or just report it?